Why Use a Seed Moisture Meter? Testing your seeds is important to know the overall quality. If you are a distributor of seeds, you want to ensure that your grains are of a high caliber, so that your customers are satisfied with their resulting crop yield. If you are purchasing seed, you know what a major investment that can be. You can protect this investment by investigating the quality before you buy. So what can a seed moisture meter do? According to Bioversity International, it is also important to know the moisture level of seeds to know an accurate prediction in the storage life of the seed. A small change in the percentage of the moisture content in a seed can make a huge difference in how long it can be viably stored before planting. What Should You Use to Determine Quality? There are two main kinds of instruments that can help you accurately measure the moisture and determine the level of quality in your seeds: moisture balances, which rely on loss-on-drying (LOD) techniques, and moisture meters designed specifically for seed and grain. So which is a better fit for your needs? LOD and Moisture Balances and Air Ovens: The LOD method can be conducted on both a large and small scale. Moisture balances are used for small samples, while air ovens are used for larger samples. In both devices, moisture is removed by drying the sample. The measurement of weight is taken before and after the drying process, and then compared to know how much moisture has been lost. This process is destructive, meaning the sample is no longer usable after determining the moisture content. It is a prevalent method in the industry to gain information on moisture content in seed samples. Our desktop model, the PQ5205 has become a worldwide standard, because of its accuracy and attention to detail. 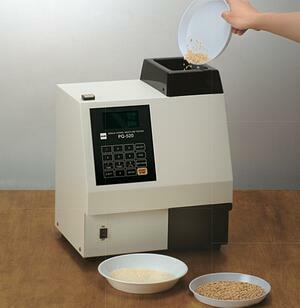 Each grain, seed, or kernel in the sample is individually tested, at a rate of 150 grains per minute. This information is stored and averaged for a whole, accurate measurement of the overall moisture content of the sample, and can measure anywhere between 1 and 1,000 kernels per sample. This information can help farmers determine the optimal time to harvest to have the best outcome of stored seed and grain. With selling and buying grain, it can help determine the overall quality and consistency of the grain to know how viable the seed is for successful planting, and with over 150 calibrations available, there’s a setting for your every need. Whether you find yourself wanting a moisture balance or a portable grain moisture meter, there’s no question that knowing the moisture content is vital to the success of the seed in buying, selling, planting, or harvesting. There’s also no question that Kett’s devices for moisture measurement are the best around, and will work to improve your seed and grain quality for years and years to come. Have more questions? Contact us today!